The Huffington Post, January 2017. The US promised more support for a refugee crisis close to home. Why has its program, the PTA, helped just one family in nearly six months? SAN SALVADOR, El Salvador – The garage of a one-story, cinder-block building has been converted into a makeshift waiting room. Six families sit in plastic chairs, anxiously waiting. They must flee the country as soon as possible. A young couple, both police officers, was threatened by gangs. Across from them are a mother and her teenage son, who were also threatened by gangs after the family’s eldest son was kidnapped. Just inside the steel door frame are two fathers fleeing threats from the police and army after their sons were captured and tortured by soldiers. Marina Ortiz spends the morning meticulously documenting their harrowing stories. She founded and directs the Human Rights Association of El Salvador, a nonprofit that helps people in danger file claims for asylum in the United States. Ortiz also receives death threats. Hers came from police officers implicated in one of the cases she worked on. “I can’t sleep,” she said. “I’m afraid the police will show up at my home.” At night, when she returns home, she makes preparations to send her own children north on the migrants’ trail to the U.S.
Death threats here have short grace periods ― often just 24 hours. In the absence of an asylum process that is fast enough, advocacy groups lean on networks of colleagues and friends to create an informal underground railroad, comprised of secret safe houses that give temporary shelter. This is a way of keeping people alive longer. El Salvador is a small country, and those hiding will eventually be found. The Northern Triangle region of Central America ― El Salvador, Honduras and Guatemala ― has the highest murder rate in the world for a region not at war. The region is also plagued by kidnappings, forced gang recruitment, extortion and sexual violence. Migrants, including many women and children, have fled to neighboring countries and the U.S. in droves, at particularly high numbers starting in 2014. In 2016, the U.S. apprehended nearly 410,000 people ― mostly from the Northern Triangle ― along the U.S.-Mexico border, up about a quarter from the previous year. As a part of its response, in July last year, the U.S. State Department announced a new program called the Protection Transfer Agreement. Under the PTA, the U.S. is supposed to pre-screen vulnerable applicants and transfer those with the greatest need to Costa Rica, where they can wait in safety while their refugee cases are processed, before being resettled to the U.S. or another country. The program is designed to house 200 people at a time for six-month periods in Costa Rica and is being piloted with Salvadoran applicants. Preemptively relocating potential refugees to a midway point this way is a somewhat novel approach. Some have advocated for a similar initiative in response to the European migrant crisis. But as of November, it appeared only one Salvadoran family had been relocated through the program, several sources close to the situation told The WorldPost. The State Department declined to confirm or deny this but said that it has admitted a “small number of applicants.” Against the backdrop of desperate need on the streets of the Northern Triangle, this stark finding begs the question: What is wrong with the PTA? Ortiz listens to two fathers whose families face death threats for reporting the kidnappings of their sons. Nov 17, 2016, San Salvador. Advocates believe there are strict qualifications that PTA applicants must meet but those qualifications haven’t been made available. Another hurdle is the ironic demand that applicants prove their lives are in imminent danger and then stay and wait, often for months, for a final decision. In other words, a problem the PTA was meant to address ― long wait times ― is now one of the PTA’s problems as well. A State Department spokesperson who spoke to The WorldPost on condition of anonymity said that “due to protection concerns, we are not currently in a position to provide the specific number of applicants who have arrived through this program to date.” He said the department anticipates accepting an increasing number of referrals in the coming months. “We are giving these cases a very high priority,” he said. When asked why so few have made it through the PTA, he said, “Although built upon existing refugee resettlement infrastructure, many aspects of this new program are being created from the ground up; designing and implementing processes and procedures within new partnerships takes time.” The department is now focusing on ways to reduce security vetting timeframes and training non-governmental organizations on the ground in identifying potential cases, the spokesperson said. The PTA is supposed to reach people in need of refuge via three levels: at the top, the U.S. State Department, the U.N. refugee agency and the International Organization for Migration, which ultimately accept or deny cases; in the middle, a handful of organizations contracted by the U.N. refugee agency that specialize in refugee issues and are responsible for the first round of vetting of applicants; and at the grassroots level, small organizations like Ortiz’s nonprofit that are the trusted community agencies at whose doors fleeing families show up daily. Advocates estimate that hundreds of PTA applications have been submitted from the Northern Triangle region. But the State Department spokesperson said the department had received applications for only about 60 individuals. It appears that many of these applications have stalled with the U.N. and the organizations it contracts. Those organizations asked The WorldPost to keep their identities secret. Because they do a preliminary review of all PTA applicants, they fear that publishing their identities would advertise to anyone who has threatened someone ― gangs, police, soldiers ― where those victims are lining up. They are also forbidden from speaking with press as part of their contract with the U.N. This model ― transporting potential refugees to temporary safe places – does have some precedent. In the U.S., it is known as the “Guam option” because the U.S. transported thousands of Vietnamese to Guam during the Vietnam War to await processing and resettlement in the U.S. In the 1990s, the U.S. also sent Iraqi Kurds to Guam to await processing, and the U.N. now has a similar emergency transit center in Romania for hopeful refugees worldwide. Henrike Dessaules of the International Refugee Assistance Project said this approach is needed for individuals who face immediate, life-threatening danger. “The entire process of resettlement can take many months,” she said. “So it makes sense to remove these refugees from their dangerous environment to a safe place, even if it is only temporary.” Of course, with room in Costa Rica for only 200 potential refugees at a time, the PTA cannot address the magnitude of need unless the program expands. The PTA may be expanded to Guatemala and Honduras this year, according to a recent U.N. refugee agency report. 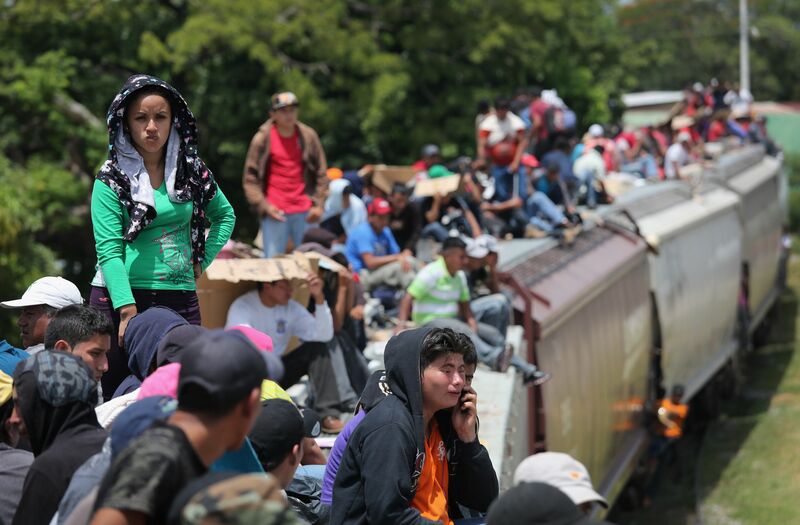 Thousands of Central Americans ride atop trains, known as La Bestia, or the Beast, through Mexico to reach the U.S. Aug. 6, 2013, near Juchitan, Mexico. 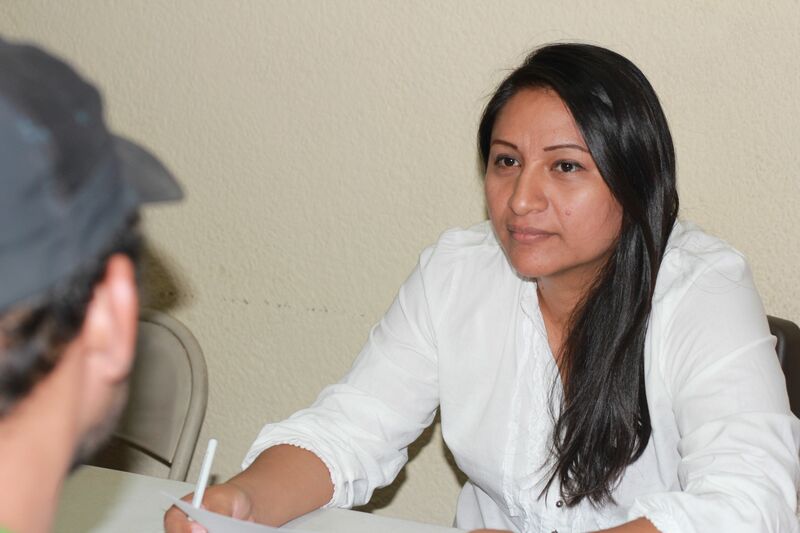 Ortiz from the Human Rights Association of El Salvador, or ASDEHU for its name in Spanish, recently referred 10 PTA applications for initial review with a U.N.-contracted organization. Of the 10, four families were fleeing threats from the army, three from gangs and one from police. Nine were rejected. The one family that was accepted is fleeing gang threats, and Ortiz believes the case is still being processed because the family remains in hiding in El Salvador. She went on: “So you say to yourself, ‘I’m going to figure out how to get them out of here some other way.’” One of the 10 families, rejected from the PTA after a three-hour interview with a U.N.-contracted organization, went with Ortiz to the human rights group Amnesty International, she said, and the organization succeeded in moving them to South America. Another family went to Ecuador with the help of the refugee rights group Asylum Access. After being rejected by the PTA, most have left for the U.S. ― on foot and without papers. The PTA’s lack of transparency goes beyond questions about whom the U.S. and the U.N. will accept. Gerardo Alegria, the highest-ranked migration authority in the Salvadoran government’s Human Rights Ombudsman office, did not know that the PTA existed. Alegria, Ortiz and Sandoval said they have never received an orientation from the U.S., U.N. or otherwise about the PTA. Instead, the program was announced in a meeting with the U.N.-contracted organizations, who also expressed frustration at how little they were told, advocates who were present said. The U.N. refugee agency and the International Organization for Migration denied interview requests made by The WorldPost. Sandoval’s clients also struggle to show adequate proof of the threats they’ve received, as U.S. immigration law demands. “People flee without anything. They aren’t thinking about taking proof,” Sandoval said. “To begin with, they’re terrified to denounce threats to the authorities.” PTA applicants also have to present documents demonstrating the inability or unwillingness of their government to protect them, which are difficult to obtain. This woman faces death threats after reporting the kidnapping by a gang of her teenage son. Nov 17, 2016, San Salvador. In order to potentially qualify for the PTA, an applicant must provide proof that he or she has a “well-founded fear of persecution based on religion, race, nationality, political opinion or membership in a particular social group,” a State Department spokesperson said on condition on anonymity. It is not commonly accepted that this definition includes threats facing Northern Triangle citizens, due to the perception that gangs and law enforcement there target the general population rather than specific identity groups. Even if a PTA applicant is accepted, the process takes months, advocates say. Those who cannot wait months for a potential yes from the PTA and who flee the country before the application process is done are no longer eligible for the program. Sandoval likens PTA’s weak start to that of the Obama administration’s Central American Minor program, which allows minors to apply for refugee status in the U.S. from their home countries. The program now also includes caretakers and certain other family members. But CAM was so poorly designed that in November 2015, after nearly one year of functioning, it had not relocated a single child to the U.S.
Of course, the future of CAM and the PTA hinges on the administration of President-elect Donald Trump, who has not yet announced anything concerning either program. “We’re trying to preempt how the new administration could affect us, and we’re working with Guatemala and Honduras” to prepare for Trump’s promised increased deportations from the U.S., said Alegria of the Human Rights Ombudsman’s office. “But deportations have been so overwhelming already.” The Obama administration increased deportations in the first half of his presidency, peaking in 2012, and decreased them since then. Still, in the first half of 2016 alone, the U.S. and Mexico deported nearly 100,000 Northern Triangle citizens. Meanwhile, the number of asylum applications from the Northern Triangle to neighboring countries and to the U.S. has continued to soar. The violence in El Salvador didn’t happen in a vacuum. During the country’s 1980-1992 civil war, the U.S. equipped and trained an army that kidnapped and disappeared more than 30,000 people and massacred thousands of innocent civilians. The country emerged from the war awash in weapons and with an abundance of trauma. Soon thereafter, Salvadorans who had formed gangs in U.S. cities were deported back to El Salvador. The response to the gangs by every Salvadoran president since has been “manodurismo,” or militarized zero-tolerance policing, which helped cause an explosion in gang membership and human rights abuses by security forces. ASDEHU director Ortiz is a child of that civil war. Caught in a battle during which her father was kidnapped by the army, Ortiz was separated from her family and raised in a state orphanage, unaware that her mother and siblings were still alive. More than a decade later, Probúsqueda, a nonprofit that reunites war orphans with surviving family members, helped her find her family. Since her early 20s, Ortiz has been working to help reunite families like hers. In 2014, she founded ASDEHU and shifted her focus to present-day cases of forced disappearances by security forces, organized crime and gangs. This entry was posted on January 24, 2017 by dmm634 in Uncategorized.